The BLS tracks labor productivity on a quarterly and annual basis. 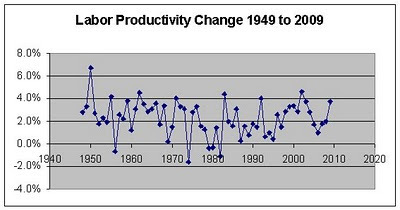 The figures they give are the % change in productivity from one time period to the next. As you can see productivity goes up the great majority of years and only a few years does productivity actually go down. Less than one in 10 years are negative. Long term from 1949 to 2009 the average increase is 2.3% and median is 2.4%. The worst year was 1974 when a drop of -1.6% and the best year was 1950 with an increase of 6.7%. Looking at the most recent 20 years from 1990 to 2009 the average is 2.4%, the median 2.3%, the worst year was 0.4% in 1995 and the best was 4.6% in 2002.